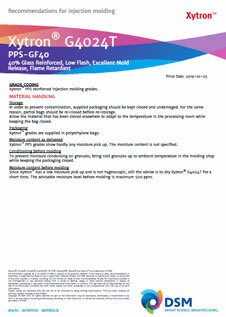 Xytron™ G4024T by DSM is a low flash polyphenylene sulfide (PPS) grade reinforced with 40% glass fiber. It exhibits excellent mold release, extremely good chemical resistance and flame retardance. It is suitable for processing by injection molding. Xytron™ G4024T is used in water pump parts, thermostat push rod, rod guides, filter box of a coffee machine and engine block heater for electric generators. 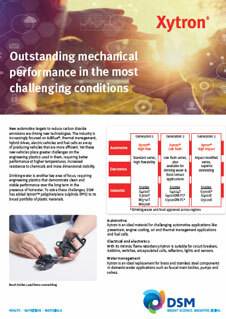 Complies with REACH, CONEG and RoHS regulations.